In a dry cast-iron skillet, toast each grain separately over medium-high heat, stirring constantly; set aside. Cook each individually in salted water according to package directions; strain in cold water; set aside. In a stainless steel bowl, whisk together the vinegars, weed sugar, maple syrup, molasses, brown sugar and ginger. While whisking vigorously, slowly add oil to emulsify into a thick dressing. Season with salt and pepper; set aside. 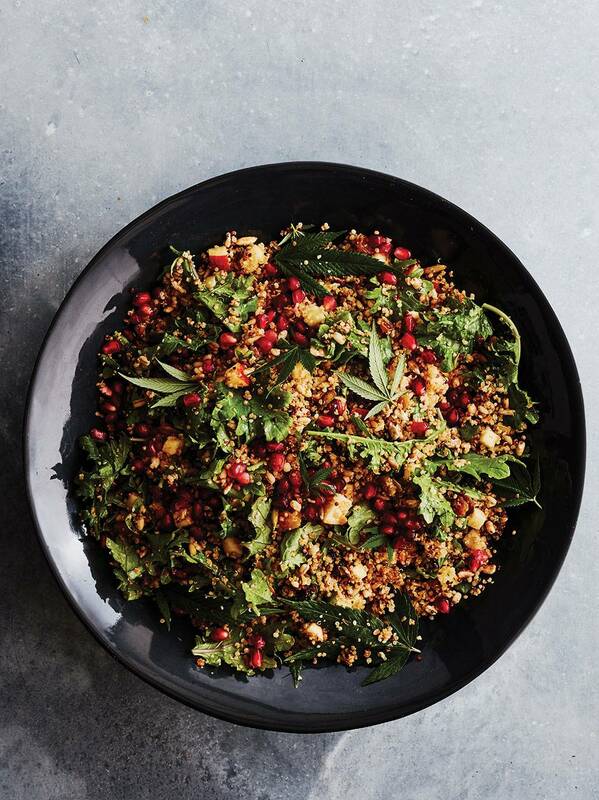 In a large bowl, combine the remaining ingredients except the greens, pomegranate seeds and cannabis leaves, and toss with enough dressing to coat. To serve, toss together the greens and grains, adding more dressing to coat if needed. Top with pomegranate seeds and cannabis leaves. Makes 8 servings, each about 2.5 mg THC. Recipes courtesy of Sebastian Carosi who uses a medicated cannabis sugar of 10:1 (10 parts CBD to 1 part THC).